HomeCinemaMasalaKochadaiyaan and Sultan The Warrior a same film? 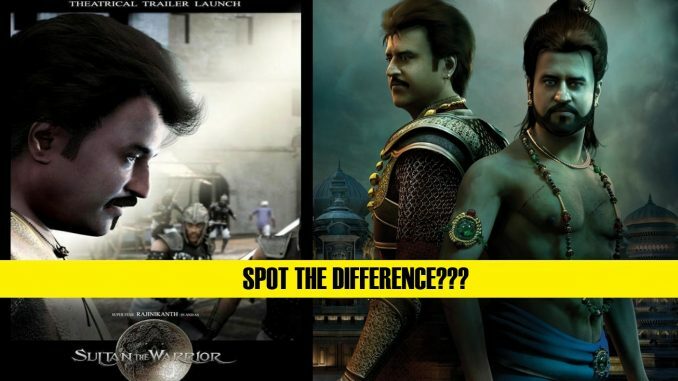 Kochadaiyaan and Sultan The Warrior a same film? The most awaited and most hyped superstar Rajinikanth’s upcoming film Kochadaiyaan’s first poster got revealed today. Since the time it got released, Fans and Trade-Media created a huge debate on the social networking sites. In the film’s poster, the South superstar flaunts two different avatars as he will be playing a double role in the film. One of a Prince and the other of a Yogi. But if you take a close look at Rajinikanth’s Prince avatar, It will remind you of the superstar’s unreleased 3D animated film Sultan The Warrior. Not only his looks, But the entire set-up (In the background of Kochadaiyaan’s poster) reminds you of the long lost film. Sultan The Warrior’s trailer was launched along with Sivaji The Boss theatrical release in 2007. Due to the reasons best known to the makers, Sultan The Warrior never got released and Rana was announced with it’s Poster Launch. Because of superstar’s ill-health, Rana was shelved too. Kochadaiyaan and Sultan The Warrior has so many things in common interestingly. Soundarya Rajinikanth (Director), Osher Studio’s and Eros International (Producers), A.R.Rahman (Music Director), K.S.Ravikumar (Writer and Co-Director) and our own Superstar Rajinikanth (Actor) of course. Sultan The Warrior was India’s first ever 3D animated feature film on Indian Superstar (That is what the makers and the film’s Trailer claimed), While Kochadaiyaan is being shot using animation effects for most of it’s part. We don’t claim Sultan The Warrior’s part would have been incorporated in Kochadaiyaan, We leave the decision up to you once you are completely satisfied with the comparison of First Teaser poster of Kochadaiyaan with Sultan The Warrior. Deepika Padukone will be seen opposite Rajinikanth. The film also star R Sarathkumar, Aadhi, Shobana, Rukmini Vijayakumar, Jackie Shroff and Nassar.